The Great Night of Shiva Celebrated on the new moon night in the month of Phalguna (generally falls in early March), and is dedicated to Lord Shiva. 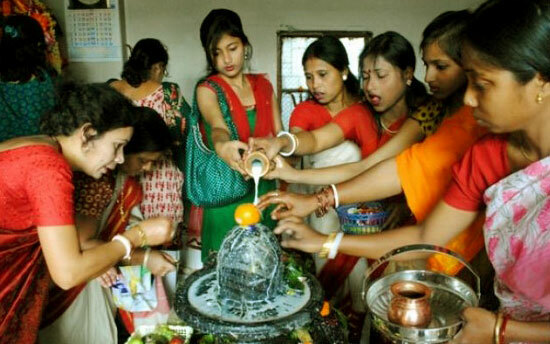 Observed especially by married women to ensure the long life of their husbands, it consists of a full day's fast and anointing the idol of Shiva with milk, water and honey. Literally 'the great night of Shiva', celebrated on the moonless night of the month of Phalguna, which is fourteenth day in the dark half, this festival is specially dedicated to Shiva, the destroyer. This is an important day for the devotees of Shiva, who stay awake throughout the night, praying to him. In all major centers of Shivalinga worship, Shivaratri, also called Mahashivaratri, is a grand occasion. From the very early morning, Shiva temples are flocked by devotees, mostly women, who come to perform the traditional Shivalinga worship and hence hope for favours from the god. All through the day, devotees abstain from eating food and break their fast only the next morning, after the night-long worship. These six items, till today, form an indispensable part of Mahashivaratri, be it a simple ceremony at home or a grand temple worship. By offering water, hugging the linga, lighting the diya and incense, and ringing the temple bells, devotees call To protect the world from annihilation.